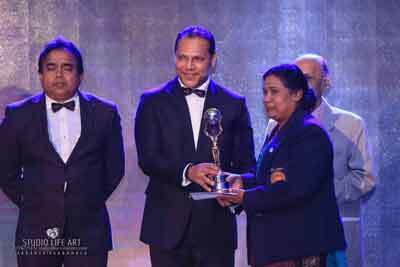 Woman FIDE Master Suneetha Wijesuriya receiving the 'SLT SILK Outstanding Dedication & Contribution to Promote Sports' award from the Chief Guest, Minister of Sports, Dayasiri Jayasekara. Sri Lanka Telecom PLC Corporate Relations General Manager Rohana Ellawala is also in the picture. At the SLT SILK Sports Awards 2017, Woman FIDE Master Suneetha Wijesuriya was awarded the SLT SILK for Outstanding Dedication & Contribution to Promote Sports, and the 25th Anniversary of her winning a Gold Medal at the 30th World Chess Olympiad in Manila, Philippines, in 1992. Between 1980 and 1997, Suneetha won the Women’s National Chess Championship on 10 occasions. She received this award not only for her victory which brought glory to the country but for her dedicated and tireless promotional work throughout the country. Suneethaa has already conducted 490 Chess coaching camps islandwide in schools, private institutes, Sri Lanka Army, Sri Lanka Navy and the Mercantile sector. The annual SLT SILK Sports Awards 2017 – Sri Lanka’s 1st Annual Sports Awards for Sports Excellence & Contribution, is organised by SPORTSINFO, Sri Lanka’s premier sports promotion network, and sponsored by Sri Lanka Telecom (SLT) was held at the BMICH recently. Minister of Sports Dayasiri Jayasekara was the Chief Guest with Minister of Petroleum Resources Development and former 1996 World Cup winning Captain Arjuna Ranatunga and Prof. Carlo Fonseka as Guests of Honour. This glittering event is organised for the 3rd successive year with the objective of appreciating those who contributed to sports in the past years, directly as participants and indirectly as unsung heroes behind the scenes, and the greats of the game.